LeBountiful seems to clear the mind and rejuvenate sluggish thought processes. This blend can also be stimulating and energizing if we are feeling tired and worn down. 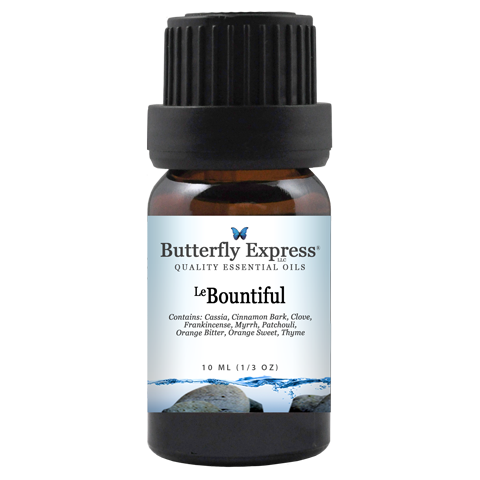 LeBountiful is also an immune support and stimulant. Although this blend is very much in the emotional realm, it has proven helpful for menstrual cramps and for lowering high blood pressure. The aroma of this blend promotes feelings of self-worth and a desire to heal. Dissatisfaction and discontentment are destructive to the nervous and immune systems. LeGrateful Heart addresses these imbalances and can provide support and healing. It has been used effectively in the treatment of some auto-immune disorders. Anethi, in hydrosol or well-diluted, has been used to relieve flatulence in infants. Anethi is also known as a mild and soothing expectorant and has been used to dilate blood vessels and lower blood pressure. Eucalyptus peppermint encourages deep, slow breaths that aid bronchial dilation when inflammation or fluids are present. This essential oil encourages circulation and eases muscular pain and tightness. Juniper berry improves circulation, particularly to the kidneys. It helps the body move fluids and toxins out of the cells and tissues. It is a useful remedy for fluid retention, cellulite, premenstrual bloating, gout, and arthritis.